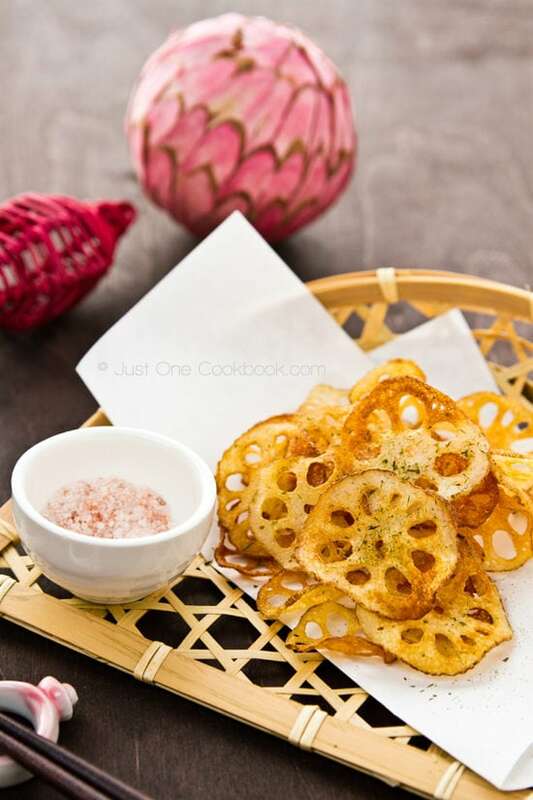 Let’s make fresh Kakimochi at home with this Japanese rice cracker recipe. 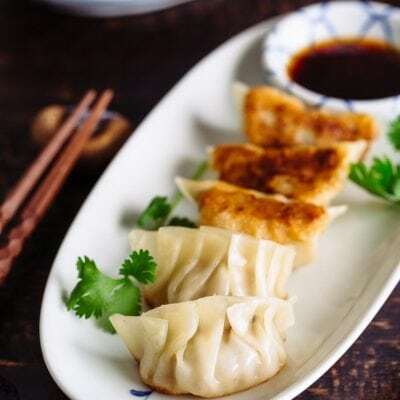 Flavored with salt, soy sauce, or your favorite seasonings, these tasty savory snack will hit the spot! The Japanese New Year celebration was over a few months ago. If you still have leftover rice cakes in your pantry or freezer and you’re not sure what to do with them, here’s a great solution. 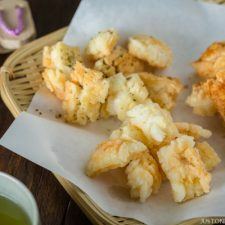 I’ll show you a quick and easy homemade rice cracker recipe. 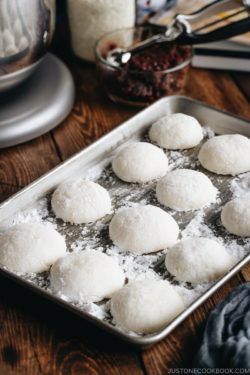 If you are all-year-round mochi eater like me, don’t forget to check out my favorite mochi recipes at the end of this post! 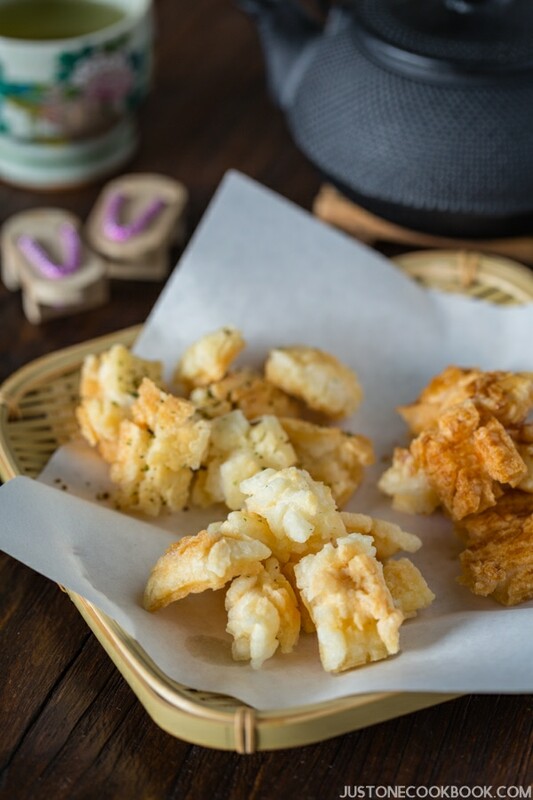 Rice crackers are a common snack in Asia where rice is the key staple food. 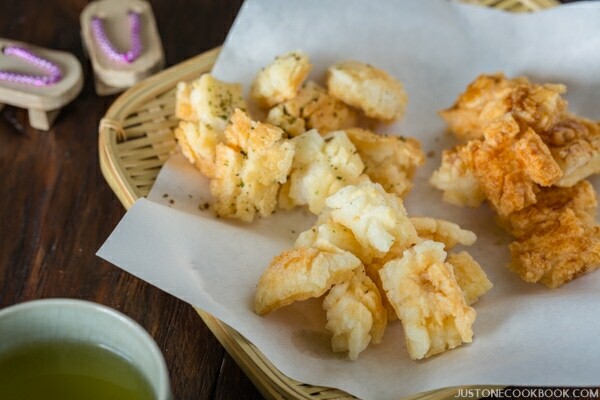 In Japan, there are two types of rice crackers: Senbei and Okaki. 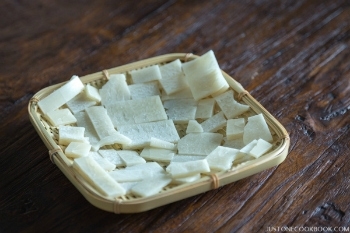 Senbei (煎餅) or Osenbei (お煎餅) are rice crackers made of rice (うるち米). The origin of senbei is actually from China. The Chinese rice crackers that were brought to Japan during Heian Period (789-1185) were made with flour (technically “flour crackers”). However, Japanese loved rice so much that they started making the crackers with rice instead. That’s how senbei started to become popular in Japan. Okaki (おかき) are rice crackers made of sweet rice/glutinous rice (もち米). We call smaller size okaki Arare (あられ). Just like senbei, okaki has been around since Heian Period. People didn’t want to toss the mochi used for New Year’s decoration (Kagami Mochi), so they scraped the mochi to smaller pieces with hands, dried them, and deep fried to enjoy the leftover mochi. You might noticed that I said “scraped the mochi with hands“. Why hands, you might ask? 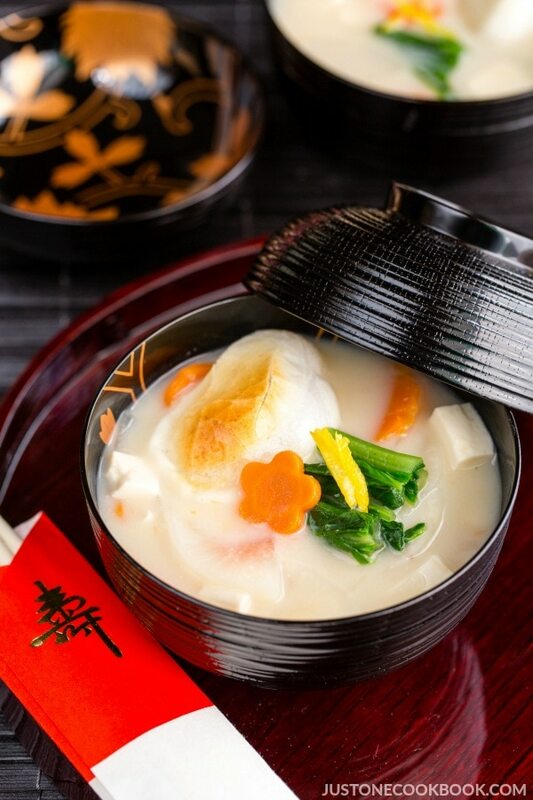 In Samurai’s house, using cutlery at the beginning of the new year was considered bad luck, so people used their hands to scrape the big mochi into smaller pieces, instead of using a knife. Rice crackers come in various sizes, shapes (squares, rectangular, round, ball), and flavors (usually savory but sometimes sweet). There are several ways to make them: you can bake, grill (traditionally over charcoal), or deep-fry. For today’s rice cracker recipe, we will use mochi (sweet rice/glutinous rice); therefore, this is a type of Okaki instead of Senbei. This particular Okaki is called Kakimochi (かき餅) in Japanese. The process to make Kakimochi at home is very easy. You just need to cut mochi into thin slices, air dry them completely until the moisture is removed, then break into small pieces and deep fry. The dried mochi pieces will puff up like popcorn while deep frying in oil. 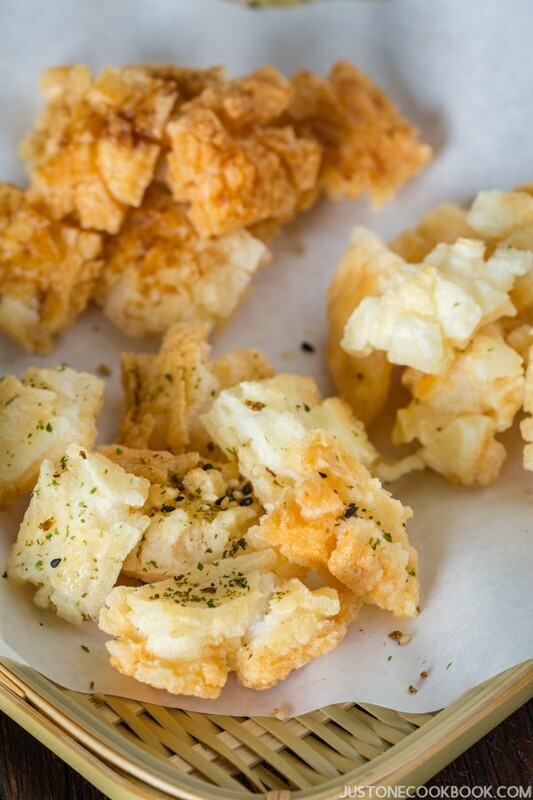 Immediately after frying, season Kakimochi with your favorite flavors: salt, soy sauce, Furikake, Shichimi Togarashi, or even curry powder! 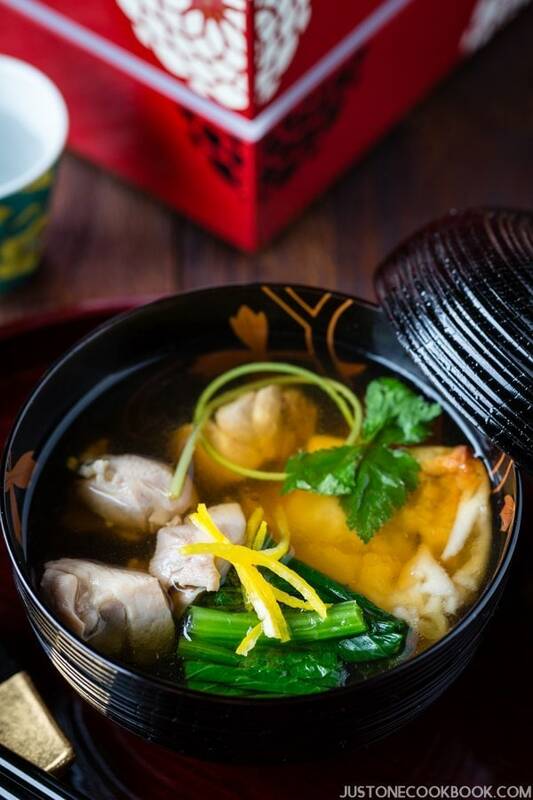 Although Kakimochi can be purchased easily at grocery stores in Japan, homemade ones are still the best! They are light and super crunchy. I like to enjoy them with green tea for my afternoon snack when I crave for something savory. With their adorable shapes, I think these rice crackers make a fun snack for parties too. I hope you enjoy making this homemade rice cracker recipe. 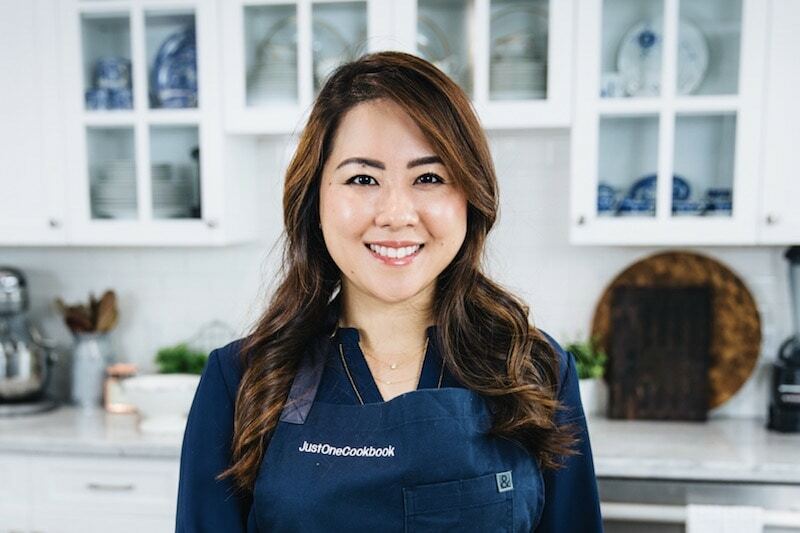 If you try it, don’t forget to share your picture on Instagram, Facebook, or Twitter with #JustOneCookbook. Thank you so much for reading, and till next time! Cut kirimochi into small pieces and 1/8” (3 mm) thickness. Lay the mochi pieces in a single layer on a flat tray or wire rack. Allow them to air dry with good ventilation for at least one week. As mochi pieces dehydrate, they might break into smaller pieces so try not to touch. The surface of mochi pieces will be cracked and flaky and texture will be harder. In a frying pan (I use a cast iron skillet), add the oil to about 3/4” (2 cm) deep and bring it to 340F (170C). Add a few pieces of mochi pieces first. If small bubbles start to appear around the mochi, then add more pieces in a single layer, keeping some space in between as they pop and expand. The mochi pieces will turn white and puff up. Turn over each piece and cook until mochi pieces are popped and lightly golden brown. Increase the heat to 350F (180C) and fry till mochi pieces are golden brown. 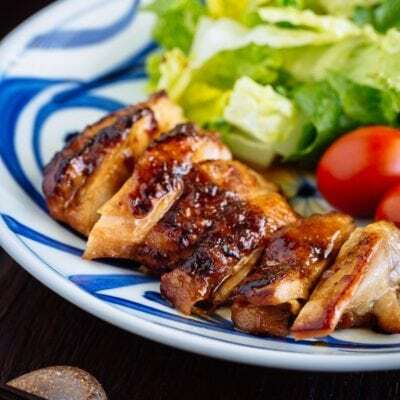 Remove the mochi pieces from the oil and place a wire rack or a plate lined with paper towels. While they are hot, season with salt. Optionally, you can sprinkle furikake or brush soy sauce (adjust the amount of salt if you use soy sauce). Best to be consumed immediately or I recommend on the same day. Prep time does not include one week of air drying. Alternatively you can bake the mochi pieces at 400F for 15 mins. You can brush oil and season with salt (so salt will stick to the rice crackers). If you have leftover dried mochi pieces, keep them in an air tight container or Ziploc bag and store at the room temperature. Hi Donna! I remember I read your email last week. I’m so sorry I haven’t had a chance to respond yet. I’m about 2 weeks behind in my email response. I’ll write you back as soon as I can! They look very tempting! An addictive snack. Love the flavor of rice crackers! Never even though of making my own, though. These look terrific — and so easy! Fun recipe — thanks. I love mochi and I love okaki but never thought of making okaki from mochi! I am going to try this. Aren’t the mochi hard to slice? Thank you Nami. 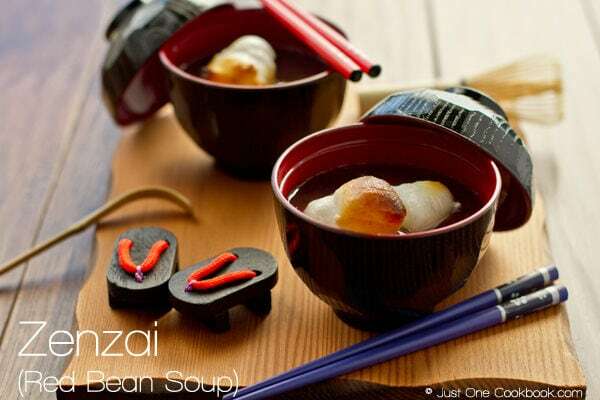 Can I do this with homemade mochi that is made in my Tiger Mochi maker? Mochi never goes to waste in my house because my older daughter’s breakfast of choice is isobe mochi. When I first married my husband he asked me to make kakimochi for him and I tried from scratch, using sticky rice. It was the first and last attempt but with mochi it must be a lot easier! Would it be possible to dry the mochi in the microwave or oven rather than wait a week after cutting? All your recipes look so good! Doesn’t the mochi get moldy after being left out to air dry? My mochi gets moldy after 3-4 days. Maybe the humid weather in Hawaii makes a difference. Hi Hana! That’s highly possible. I live in California and it’s pretty dry all year around. I haven’t seen my mochi got moldy before. Make sure the air goes through when you dry too. The best scenario would be dry in the sun (with air going through) (but be careful not to crack) and get it dry as soon as possible. I love your receipes !! Thank you so much, Aurelie! Was wondering if you could use a dehydrator instead of leaving the mochi out for a week. I worry where I live because of humidity the mochi will start to mold? I made these and they were delicious! 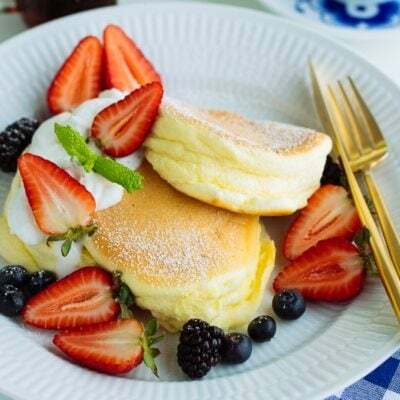 I used kirimochi and baked them. I have to admit I did not wait a week, too impatient! They were great warm, and crispy. If I wanted to make them for guests spur of the moment without waiting to dry, would they come out ok? Hi Julie! LOL! Thanks to your impatience, we got to know that we can use oven to bake them to dry!!! Wait, did you just bake for “drying” purpose, or you skipped the deep frying and baked instead? So happy that you tried! Thank you for letting me know! Sorry to be unclear Nami. I did air dry just as you instructed, but for only 3 or 4 days instead of a week. Then I used your alternative method to bake them instead of deep frying. Thank you! I made these with some leftover mochi I had in the fridge and they were brilliant, salty sweet and crispy. I think my oil might have been too hot and they burnt a little though, and I will dry them out longer next time. Thanks for the lovely ideas! Hi Fred! How wonderful that you’re making kakimochi! Nowadays, no one owns own usu and kine at home. It’s so great to hear that you keep the tradition going, even outside of Japan! Such a beautiful tradition to keep going! It does gets flaky. Your sesame kind sounds delicious! I just made a batch of these. Baked and fried. So good! Both were delicious, although the fried were a little more delicious… I am going to try to bake another batch and brush with oil. The first baked batch I put in the toaster oven naked. We have a mochitsuki every year and always have leftover mochi. I just found a dozen in my freezer and tried this. I did not let them dry out for a week so I may also try that. 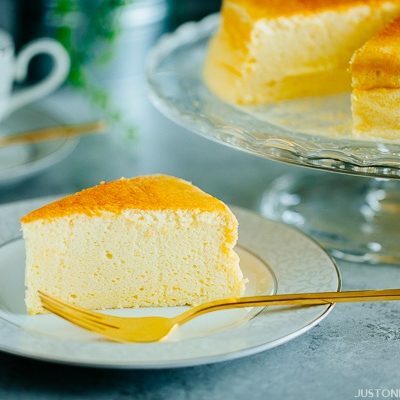 Thank you for the great recipe!!! I made this the other day (without the soy) and my husband said it was EXACTLY how his mother used to make it. Makes me feel good that I can recreate (thanks to you) all of his Japanese favorites. I’m Nisei and I’ve missed my mom’s kakimochi and last had some over 30 years ago. She always had some dried commercial varieties (multi-colored strips in pink, light green, yellow or white in a rectangular form) in her cupboard when I as a child from my parents’ numerous trips home to Meguro, Tokyo. I’ve always wanted to make my own at home but alas live in a part of rural Canada where finding pre-made mochi almost impossible to find. 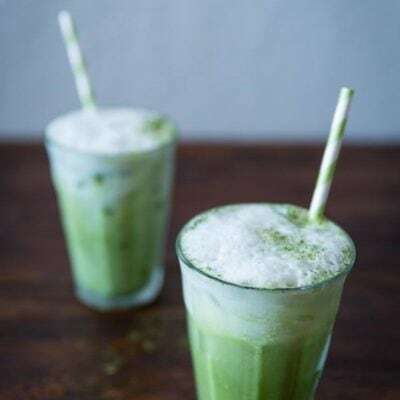 Do you know if there are any mail order retail outlets where I might be able to find and purchase mochi or kakimochi? Hi Jiro! 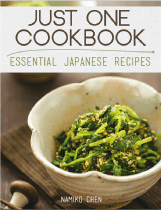 Recently I collected information about Japanese grocery stores around the world from JOC readers. There are many Japanese stores in Canada and I wonder if you can find any of these stores that have also online shop? I hope you get to make homemade ones one day…. they are delicious! That Amazon item is kirimochi, I think. It’s not dried. 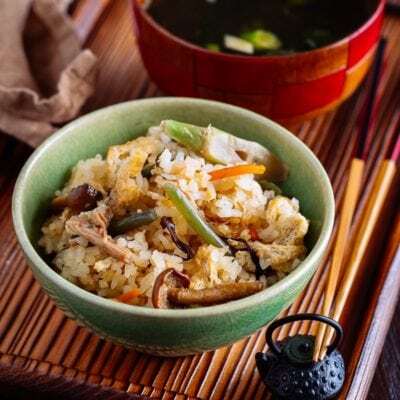 You should be able to make fried rice cakes with them by following the above recipe. Yes, it’s kirimochi that I’m using, and they are mochi cut into rectangular/circle shape. I make a rough version by scraping half-burned rice off the bottom of the pot and deep fry it. Very crunchy. 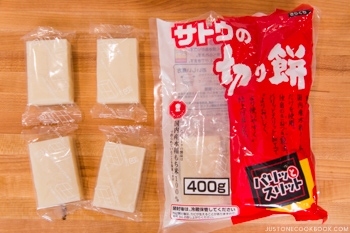 Another simple fast way to cook is putting the mochi, after its been dried, in a brown paper bag folding it closed and microwave for about 2 minutes 20 secs. depending on the size just taste and cook until completely crunchy inside just like making popcorn. For the lazy person haha. Haven’t tried it fried probably tastes better. Also to dry the mochi you can put the mochi in a plastic colander and put that into a laundry net and hang outside in the sun. I thought that was pretty clever. 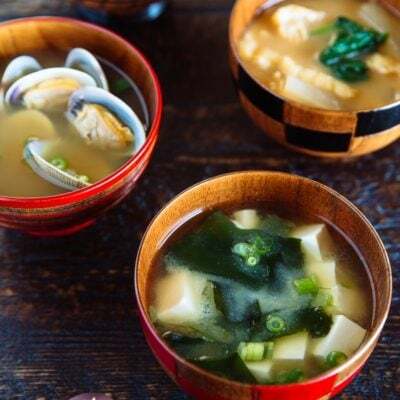 Anyways love your blog, as a Japanese American I’m glad I found a website with authentic dishes(have used sites not so) I can go through and try different dishes instead of making the same old standards so thank you. Hi Pam! Thank you for all these wonderful notes and feedback you shared with us! First of all, thank you for reading my blog and kind and encouraging words. Really happy to hear you enjoy my blog. I love the laundry net idea. In Japan we love nature way to do things, and I can imagine my grandma’s house having food hanging around etc. Haha. Thanks for the “popcorn” method too! 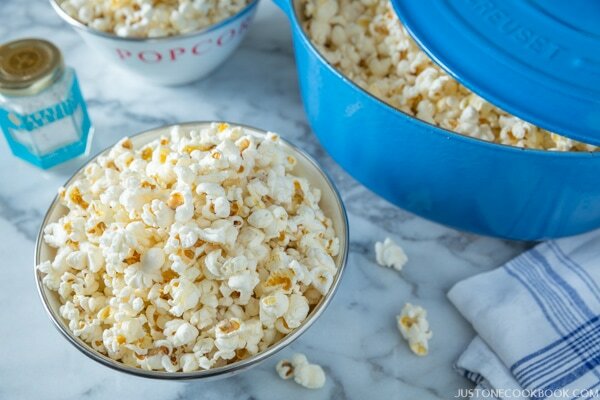 I’m still enjoying eating mochi, but when I get the leftover kirimochi, I’ll start making this popcorn method. 🙂 Thank you once again! You can also just put the soy sauce and rice cracker in a sealed container and shake it on and then do the same for the seasoning. Just brush the soy sauce on spots you missed. Then microwave again for like 10 or 20 secs. back in the paper bag to set the soy sauce otherwise its a tiny bit wet and soggy from the soy sauce. Actually put it outside when the sun is behind the clouds in the shade otherwise it will probably break the mochi and a light wind helps. I love your recipes. 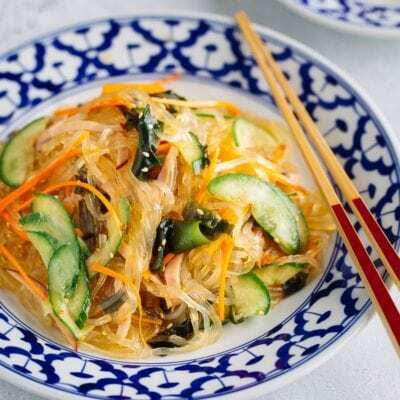 I am Sansei, so your recipes have taught me how to make authentic dishes, especially the Osechi Ryori recipes, thank you! A group of us are making mochi with a machine and I would like to make kakimochi. Would I just roll a piece out flat and cut into squares? Then should I dry them out before I fry them? if i air dry the mochi in room temp for a week.. wouldn’t it go bad? Hi Sisca! It won’t as long as . you keep the moisture out. If you live in a humid environment… maybe possible it gets moldy? You’re supposed to put it where there is natural wind in and out. Hi Ross! 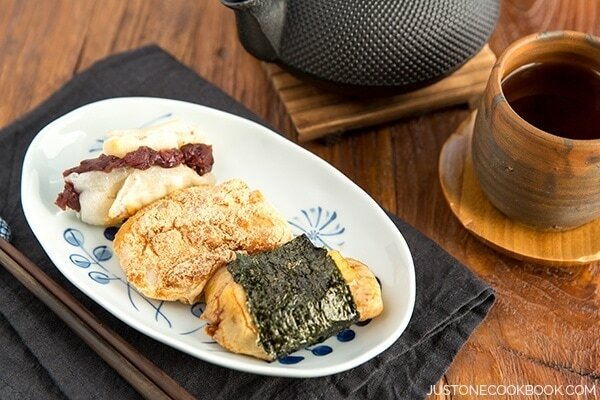 It might sound strange, but Japanese don’t really make senbei at home because it’s something we get easily at the store and much more work when you make it at home (and it stales fast). To make thin senbei, you rely on some machinery to flatten and cook on low heat for a long time etc. What I see online is to make senbei with Joshinko 上新粉 and water. Mix and steam it to cook and knead, then flatten it and let it dry for 3-5 days before baking/cooking over the frame. You brush on the senbei to apply soy sauce. It sounds easy but I think it’s a long process to make it. I wish I know it and hope to make it one day for fun… I just don’t have the recipe now… sorry, Ross! I don’t own an oven and I am no fan of deep-frying. 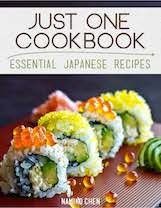 So I’ll try to get my hands on some Joshinko, do as you say and grill or bake them one way or an other. I have a small grill in the top of my microwave, I’ll try that first; maybe I’m lucky and that will suffice? I’ll make sure to dry it well first. I’ll let you know if it works out…. 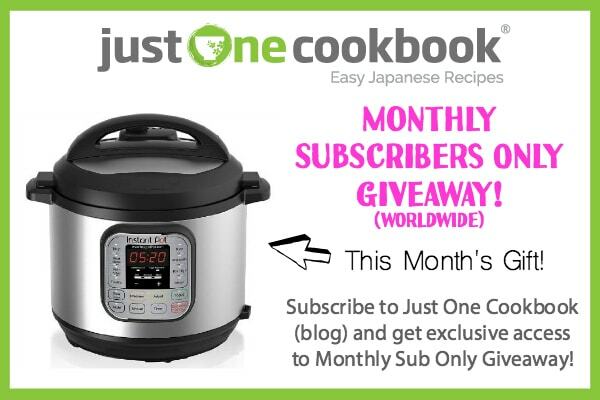 It might be useful for someone else, who also doesn’t own an oven! Hi Ross! Good luck and keep me posted! If I find a great method, I’ll definitely share!